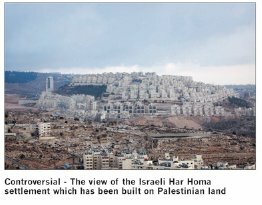 Har Homa is often cited by Israel's detractors as an example of Israel stealing and building upon Palestinian land. Therefore it seemed worth doing a little digging on the Internet to see how much truth there is in the accusation. See also Gilo - also ridiculously described as a "settlement" in the media. The essence of the argument is the word expropriation. What do you think it means? Misappropriation - as in theft? The establishment of 22 new towns between 1946 and 1970 was an ambitious programme to provide new homes and jobs following the last World War. It was based on the ideals developed earlier in the century by Ebenezer Howard's garden city movement which sought to create better environments for people away from the smog and cramped conditions in inner urban areas. The subsequent New Towns Act in 1946 established the New Town Development Corporations, and outlined the model for the management, design and development of New Towns. - Public Corporations were to be set up, sponsored and financed by the Government through Treasury loans. - The New Town Development Corporations were managed by a board appointed by Central Government. - They were given planning and compulsory purchase order powers. I have not noticed Israel's accusers explaining the meaning of expropriation - or from whom land was expropriated ! Har Homa is also commonly, maliciously, referred to as a "Settlement" confusing it with illegal settlement building activities. This picture is from the Baptist Times of 18th 2008, in an article entitled, "Blessed are the Peacemakers" referred to in My Denomination. In the 1940s a Jewish group purchased 130 dunams (32 acres) of land on the hill between Jerusalem and Bethlehem known in Arabic as Jabal Abu Ghneim, and the Jewish National Fund then planted a forest on the site. During the 1948 Arab-Israeli War the hill was a base for the Egyptian Muslim Brotherhood, a position taken over by Jordan's Arab Legion. The Hebrew name "Har Homa", or "Wall Mountain", stems from a structure built on the remains of a Byzantine church there: the Palmach forces at neighboring Kibbutz Ramat Rahel saw the wall looming over the Jordanian fortifications as an imposing sight and named the hill for it. Unlike other JNF forests in areas captured by them, the Jordanians didn't allow Jabal Abu Ghneim's trees to be uprooted, and added to them. After Israel captured the hill from Jordan in the 1967 Six Day War, a group was set up to purchase land on the hill from Arabs, and the forest was thickened by the JNF. There were plans for residential development as early as the 1980s, but they were successfully opposed by Israeli environmental groups who worried about decreasing open areas in Jerusalem. In 1991, then Israeli Cabinet Minister Yitzhak Moda'i approved the expropriation of land on the forested hill for a new building project. Former Prime Minister Shimon Peres initially approved construction plans for Jewish homes on the site, but decided to postpone groundbreaking to avoid a conflict with the Palestinians, who were taking legal action through the Israeli courts to prevent construction (Boston Globe, 5/1/98). Groundbreaking for the building of apartments did not begin until March 1997, under the government of then Prime Minister Benjamin Netanyahu, which asserted that construction of homes at Har Homa is a legitimate expansion of Jerusalem (Boston Globe, 5/1/98). By the end of July 1998, the Israeli government had completed the confiscation of the land at Har Homa from its owners in preparation for building (Agence France Presse, 7/27/98). Har Homa (Jebal Abu Ghneim in Arabic) is a tree covered hill located in the southern municipal boundaries of Jerusalem between the Arab village of Um Tuba and Bethlehem. For many years, it was designated by the Israeli Jerusalem Municipality as a "Green Area" - an area restricted from development in order to preserve its ecological diversity (Applied Research Institute of Jerusalem Website). In March 1997, the Israeli government announced it would build 6,500 Jewish homes, expected to accommodate 30,000-40,000 Israelis, at Har Homa. This announcement led to Palestinian riots and a breakdown in the peace talks. Following these events and heavy international pressure, construction was frozen. Former Prime Minister Shimon Peres initially approved construction plans for Jewish homes on the site, but decided to postpone groundbreaking to avoid a conflict with the Palestinians, who were taking legal action through the Israeli courts to prevent construction (Boston Globe, 5/1/98). Prime Minister Netanyahu changed the Israeli policy in March 1997, asserting that construction of Jewish homes at Har Homa is a legitimate expansion of Jerusalem (Boston Globe, 5/1/98). In May 1997, the Israeli government announced plans for the construction of 3,000 new apartments and 400 government financed housing units in the Arab neighborhood of Sur Bahir, which faces Har Homa. The plans were originally initiated in 1994, but were revisited in May 1997 as a means to balance the building of the Jewish development at Har Homa (Jerusalem Post, 5/23/97). The Palestinians denounced the project as a Jewish settlement, stating that it will complete a ring of Jewish settlements around Jerusalem and seal off the city from the Palestinians (Applied Research Institute of Jerusalem Website). The PA views the project as a violation of the peace agreements because it creates facts on the ground which predetermine final status negotiations (Palestinian National Authority Official Website). Palestinian officials dismiss the construction of Sur Bahir as a ploy aimed at deflecting international criticism set off by the work at Har Homa (Baltimore Sun, 5/23/97). Har Homa is a hill south of Jerusalem's old-city. It is uninhabited, owned primarily by Jews and destined for new housing for both Jews and Arabs. Yet it is this hill which has come to symbolize the usurpation of 'Arab land', eviction of Arabs from their homes, demolition of those homes, and the occupation of that land by Jewish right-wing fanatics. So much propaganda has been thrown on the symbolism of this hill that any uninformed viewer of international news would think that all of the evils of Israeli administration of this ex-Jordanian land were to be found there. The reality, of course couldn't be more different. As the symbol of such evil, if the Har Homa project were shown to be benign and not a human rights disaster as it has been portrayed, then once more all such anti-Zionist claims become questionable indeed. The Har Homa housing project is the latest propaganda battlefield for those involved in the Middle East peace process. International media reports frequently describe the uninhabited hill South-East of Jerusalem as part of 'Arab East Jerusalem' or 'an Arab neighborhood in Jerusalem'. Who owns the land allocated for the Har Homa housing project? Israel's plans to build new housing in the Har Homa area of municipal Jerusalem have been widely misrepresented in the media and by Palestinian spokespersons. The project has been cast as "right-wing" a land-grab, a violation of the Oslo Accords, and the continuation of an alleged Israeli policy of "Judaizing" Jerusalem by preventing Arab growth and building in the city. The facts tell a different story. 1. An area of 1850 dunams (about 460 acres) was expropriated by the government for the Har Homa project. Of this, 1400 dunams came from owners and 450 dunams from Arab owners. Among the parcels expropriated, the largest (almost 800 dunams, or about 43%) belonged to David Meeri, who is Jewish. 2. Much of the 1400 dunams owned by Jews was acquired prior to 1948. Following the 1948 War of Independence, in which Jordan occupied the West Bank and half of Jerusalem, the *Jordanian* Custodian of Enemy Property planted a pine forest at Har Homa to prevent misuse of the land by local Jordanian residents. Since 1967 that forest has been maintained by the Jewish National Fund. 3. All of the land in question is vacant, most of it forested. No homeowners, Jewish or Arab, will be displaced by the project. 4. All owners were offered full compensation for the land taken. Nevertheless, both the Arab and Jewish owners contested the expropriation in court. The matter eventually reached the High Court, which denied the claims and ruled in favor of the government. Makor Issues and Rights Ltd. owns 568,000 square meters of land on Har Homa neighborhood in Jerusalem and has an option to buy additional 364,000 square meters there, a total of 932,000 sq. meters. Makor planned to build on this land 6,500 apartments, 3 hotels and shopping center in eight stages. The total sales volume was estimated to $1.5 Billion. In 1991 the land in Har Homa owned by Makor was confiscated by the Israeli government for the same purpose, to build residential neighborhood. The company is entitled to receive just compensation. The issue of Har Homa is known to the public and the media as an issue of dispute between Palestinians and Israelis, where each side claims its right to control the area. What escaped from the eyes of the public and the media is the fact that the problem originated not as a result of political confrontation, but rather as a result of governmental and municipal officials' determination to develop the land without the landowners. The question has never been and is not to build or not to build. The question is should the owners build, or should the land be expropriated and given to government-designated builders. In 1991 the Government of Israel made use of Land Expropriation Law, 1943, which is intended for land expropriations for public purposes, such as military bases, hospitals etc. The law was not intended for seizing lands from enterprise companies (such as Makor, which planned to build a neighborhood there). Three times was the Israeli government changed since the expropriation in 1991. And still, the country is involved in deep political and budgetary crisis, proving that government-instituted construction on Har Homa does not contribute anything to Israel's position in East Jerusalem. In fact, the contrary is the case. We state that control over territory and land ownership are two distinguishable things. The land for Har Homa was not stolen from Palestinians. The Israeli administration, with typical lack of foresight, failed to make decisions and explain them to the world in a manner that was not easy to misconstrue. The Palestinian objection was actually a desire to prevent Israel building because it might strengthen Israel's bargaining position. Palestinians do not explain that, but say, or allow their supporters to believe, that the land was stolen.